Epic Spell Wars of the Battle Wizards: Melee At Murdershroom Marsh – Now that is a title – Come check it out on the Tabletop Spotlight! 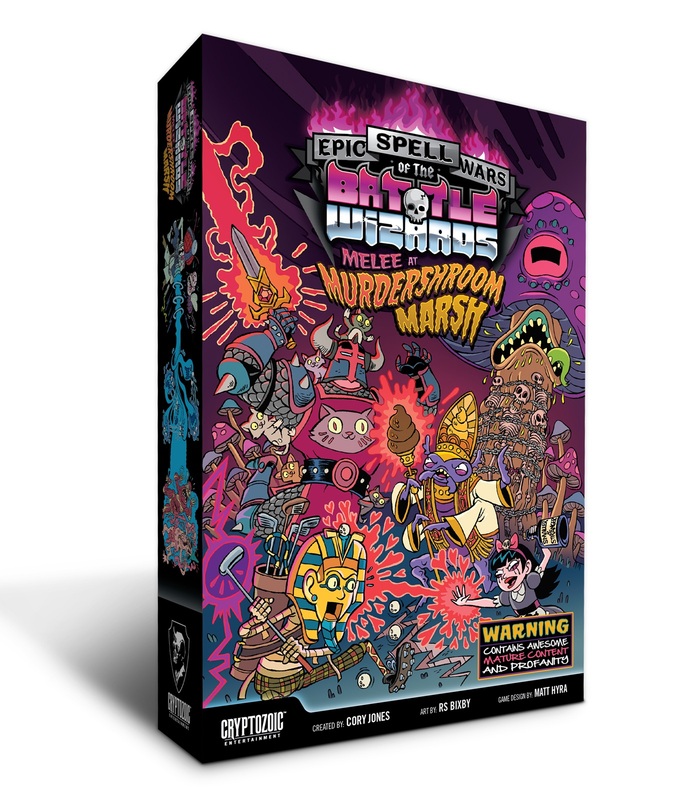 Our friends at Dragon’s Lair Comics & Fantasy brought over the next installment of Epic Spell Wars and it’s 85% more awesome/offensive than the last two sets – COMBINED! If you’re not familiar with Epic Spell Wars – it’s a card game where players play spell cards in an attempt to be the last wizard standing. Each spell card is one of three types: a Source, a Quality, or a Delivery. 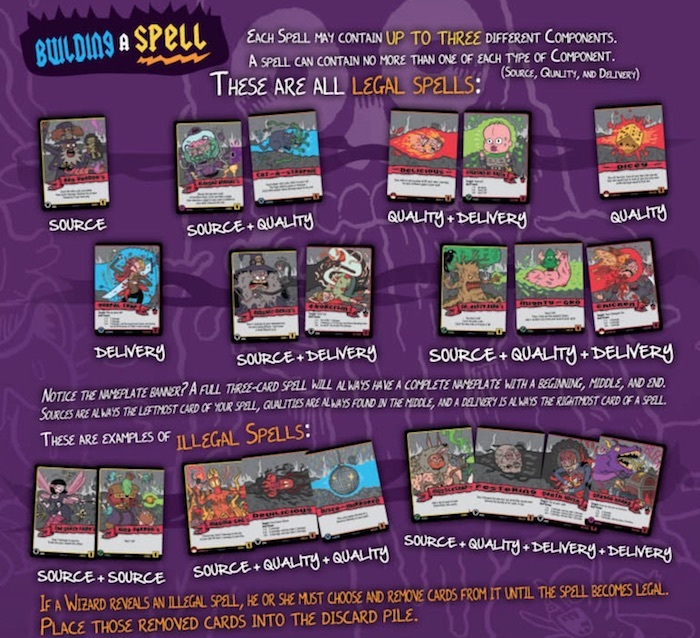 A legal spell is made up of 1 to 3 cards but cannot have more than any 1 of each type. So you can play a spell that is just a Source, a Quality, and/or a Delivery, but you cannot play a Source/Source/Source combination. The spells cards all do different things – mostly they involve doing messed-up things to the other player including damaging them. You also get bonuses if your spells match but they don’t have to. That’s a basic rundown of the game as the winner is the last wizard to be alive (or in some cases, the last wizard to die). Murdershroom Marsh adds a completely new set of cards that are 100% compatible with the previous expansions. The big addition is the addition of new “Cantrips? and “Bad Trip” cards. They also introduce new “Dual Glyph” cards as well which are great for getting those extra bonuses on your cards. Epic Spell Wars doesn’t take itself too seriously, you’re even supposed to read off the “spells” in your best wizard voice. It’s got a pretty unique art style that is super-cartoony and hyper violent. If you’re a fan of shows like Rick and Morty, or Super Jail (or similar shows) you’ll probably get a kick out the art and humor. If those things offend you…well, maybe this one isn’t for you. But for everyone else, it’s actually a pretty fun time! Murdershroom Marsh is out and in stores now – so get out there an sling some spells! Last wizard standing wins! Epic Spell Wars is back with Melee at Murdershroom Marsh! Fully compatible with the previous releases, or played standalone, this latest set has all new mayhem and explosions to scratch that spell-building itch. Features two new keywords: Cantrip and Bad Trip. Cantrips are spells that can be played out of your hand at the cost of discarding other cards. Great for when you hand is jammed with too many cards of one type. 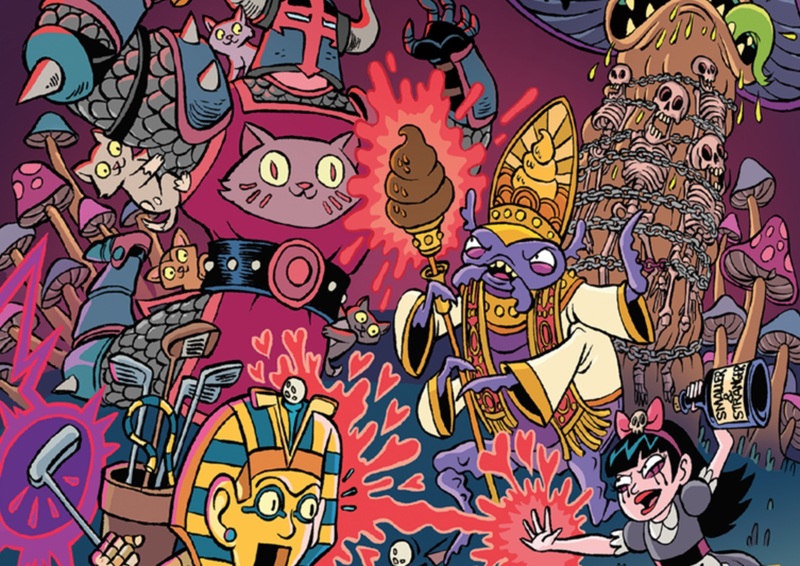 Bad Trip is all about the colors, man. If your spell contains three or more different glyphs, a Bad Trip card resolves twice! You can get that pretty easily as half of the Delivery Spells are DUAL GLYPHED. Boom! See, explosions. The other half of the Deliveries are Creatures. Yes, they are back!!!! I bet they don’t teach THAT at Hogwarts!